This post has moved to http://blog.brasskazoo.com! In a previous post introducing BDD I outlined a simple bus ticket application. Since then I’ve been looking at JBehave, and thought I’d try building a simple version of the bus tickets project, using JBehave to support behavior-driven development of the application. JBehave is a testing framework that takes the BDD concepts and applies it to JUnit tests, so you can effectively test your acceptance criteria directly using automated unit tests. It uses BDD acceptance criteria as steps in a test case, and each Given/When/Then statement is interpreted and executed as a method. The acceptance criteria is simply stored in a text file which is read by JBehave when the test case is run. Download the distribution jars from http://jbehave.org (at the time of writing, version 2.3.2 is the latest), and extract it to a convenient location! Set up references to the jars in your project (you need to reference at least hamcrest, junit-dep and jbehave-core for this example to work). 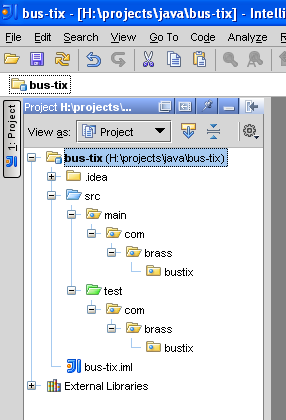 For the purposes of this example, I’m creating a project I’ll call ‘bus-tix’, with production and test code packages. I will use this as the behavioural spec for the initial work on the application. From the description of the scenario, we can instantly tell that we’re going to need a coin handler and time indicator as part of the application. Now before I put this into a text file, I must point out that the default configuration of JBehave requires that the scenario files are named to match the class names of the test case – so if we had the test case InsertingInitialCoins, then the scenario text file must be named inserting_initial_coins (with no extension). I don’t particularly like this, so as you’ll see I modify the constructor so that I can call my scenario ‘inserting_initial_coins.scenario‘, to make it clear the purpose of the file. We’ll need to create a test case, which extends org.jbehave.scenario.Scenario, and a ‘step’ class which extends org.jbehave.scenario.steps.Steps. The step class will contain all the corresponding steps for the scenario file(s). The default constructor calls the custom scenario file loader, so that we can append ‘.scenario’ to your scenario files. If I were creating several of these test scenarios, I would pull all that up to an abstract class to avoid re-writing those constructors. Perhaps confusingly, the test has passed despite the steps not being executed – PENDING means that the step hasn’t been executed because no corresponding method has been found. And then JBehave knows that the function following that annotation is what needs to be executed for that step. The assertion statement ensures that the test will fail – an empty test will pass (as it usually does with JUnit). The ‘ensureThat’ function comes from JBehave’s wrapping of hamcrest matchers – an interesting alternative to Junit’s assert statements. I won’t go into them right now. Rerunning the test, we get the failure we want! At this stage, we’ve got our steps outlined for our basic scenario, and we can begin the test-driven development of the application! Note: when you have a scenario step that begins with an ‘And’, it is still considered as one of given/when/then, e.g. Next: check out the hamcrest matchers to make sure you’re getting the full potential from your asserts!